Einstein’s 1905 Special Theory of Relativity is primarily about the velocity of a ray of light after it is emitted from a material body (such as a light bulb), and when it then travels through a vacuum toward another moving body (Figure A.2). For several reasons, Einstein did not understand Maxwell’s theory for the constant transmission velocity of a light ray with respect to a vacuum. 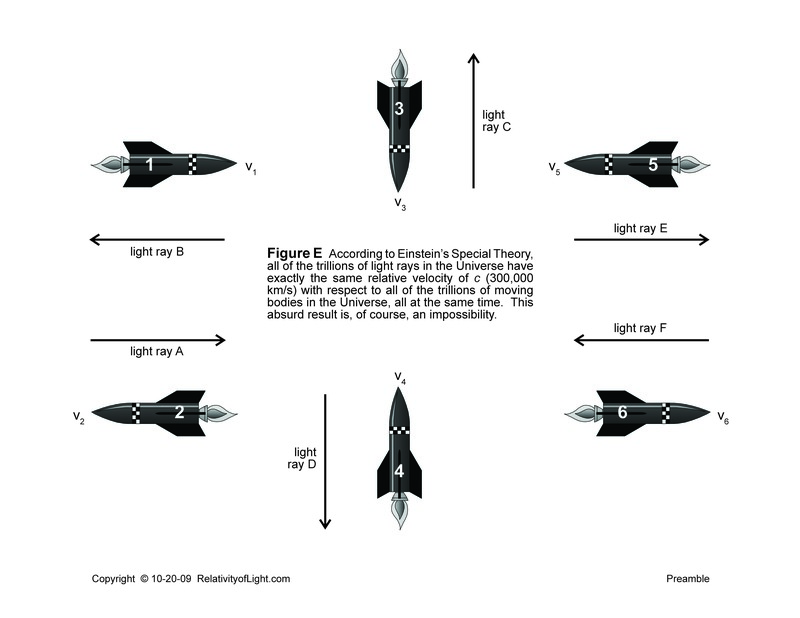 Instead Einstein assumed that the velocity of a transmitting light ray must be described and measured with respect to a material body (such as a rocket), which body might be moving toward or away from the light ray (Figure A.2). In early 1917, Einstein wrote a little-known treatise, entitled The Principle Ideas of the Theory of Relativity. Einstein’s treatise described: 1) his total misinterpretation of Maxwell’s theory, and 2) the major false premise upon which his entire Special Theory of Relativity was based. In his 1917 treatise, Einstein described the following thought experiment. Imagine a ray of light sent by the sun in a certain direction. According to Maxwell’s theory, this light ray travels away from the sun at 300,000 kilometers per second (Figure B.1). At this point in his thought experiment Einstein was correct, because the velocity of the light ray traveling at 300,000 km/s, minus the velocity of the body moving at 1,000 km/s in the same direction, is 299,000 km/s. However, this velocity of 299,000 km/s is only the very natural relative velocity between the light ray transmitting at 300,000 km/s and the body moving at 1,000 km/s in the same direction. Nevertheless, Einstein misassumed that his computations must be wrong, because he incorrectly believed that the constant transmission velocity of the light ray had somehow changed from c (300,000 km/s) to 299,000 km/s. This change in transmission velocity (if it had actually occurred) would have violated Maxwell’s Law for the constant transmission velocity of light at c, which law had been verified in many experiments. Einstein was bewildered by this paradoxical result. 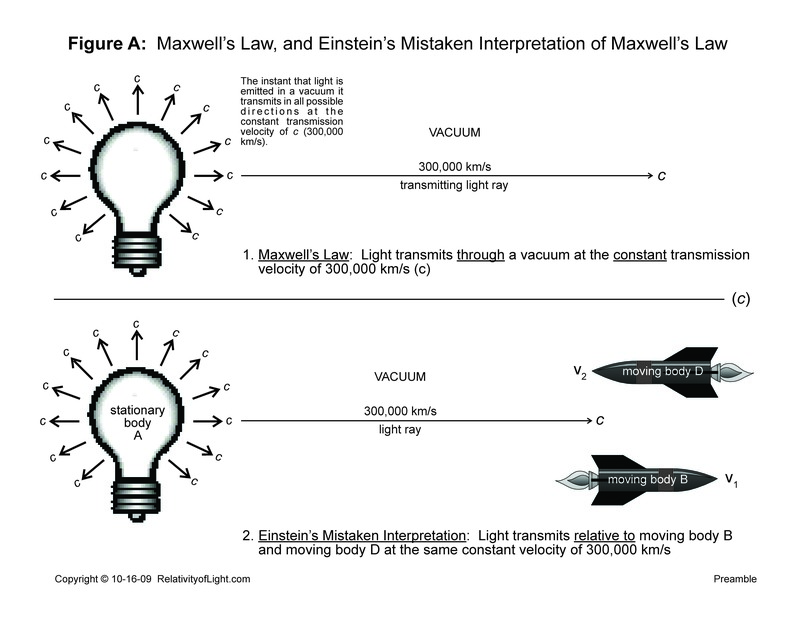 Einstein decided to defend Maxwell’s Law by mathematically manipulating the problem which he perceived, so that Maxwell’s Law could always mathematically remain 300,000 km/s relative to any uniformly moving body in the Universe, regardless of such body’s relative velocity with respect to the light ray. Einstein accomplished this artificial and physically impossible mathematical trick with a set of transformation equations (called the “Lorentz transformations”). These “magical” equations automatically change any relative velocity of a light ray to exactly 300,000 km/s with respect to any uniformly moving body, regardless of such moving body’s velocity relative to the light ray. Physicist Lee Smolin referred to this mathematical trick performed by Einstein as “the trick that made relativity special” (Smolin, pp. 228, 229). In spite of Einstein’s ingenious mathematical manipulations, it turns out that they were totally unnecessary, because in reality there was no problem with Maxwell’s Law that needed fixing. What Einstein failed to realize was that he was actually dealing with two different types of velocity for the same light ray. The first velocity was Maxwell’s constant transmission velocity of the light ray at 300,000 km/s through a vacuum. The other velocity (299,000 km/s) was merely a relative velocity of the light ray which very naturally changes with respect to every differently moving body. To confuse Einstein even further, both of these different velocities of the light ray were occurring at the same time. “Should the velocity of the light ray when it travels away from the moving body really be different than when it travels away from the sun” (Figure B.2). This answer by Einstein was, of course, physically impossible and completely wrong. Einstein should have answered, “Yes, the two velocities must be different, because the velocity of the light ray with respect to the moving body is merely a relative velocity of 299,000 km/s (300,000 km/s minus 1,000 km/s). 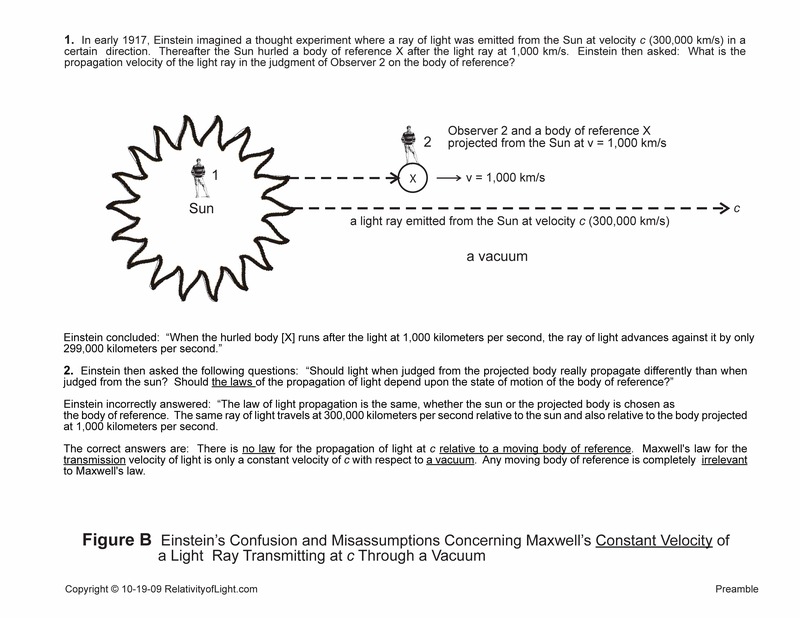 The reason for Einstein’s mistake was that he described and measured the velocity of the light ray with respect to the sun and the moving body, instead of with respect to the vacuum (like Maxwell did). This mistake was also Einstein’s fundamental false premise for his entire Special Theory of Relativity. Only if the velocity of the light ray is described and measured with respect to the vacuum (as Maxwell did) can the transmission velocity of the light ray always remain a constant 300,000 kilometers per second through a vacuum. This is the very simple correct answer to Einstein’s bewildering paradox. Einstein’s absurd conjecture that two seconds of time measured from two differently moving bodies have unequal durations of time was, again, physically impossible. But he had to think of something in order to attempt to defend Maxwell’s Law. Thereafter, Einstein contrived his entire Special Theory of Relativity in a fruitless attempt to mathematically justify his monumental false premise, his ridiculous conjecture concerning the unequal durations of the same periods of time, and the bizarre concepts which he mathematically concocted for his Special Theory. Let us now briefly describe what Einstein did in his Special Theory. In order that his artificially constant velocity of any light ray at c (with respect to any moving body in the Universe) could remain mathematically consistent with all of the other concepts of physics, Einstein was forced to mathematically distort Newton’s laws of mechanics as well as all of the other laws of physics. Einstein accomplished this feat by claiming that all of such laws of physics were dependent upon relative velocities and therefore that he must also apply the Lorentz transformations to them. Sure enough, when Einstein applied the Lorentz transformations to the other perfectly valid laws of physics, they became distorted into invalid laws. This was no problem for Einstein. He then attempted to mathematically demonstrate that the invalid laws of physics which he had just created were now really valid laws. By the end of his Special Theory, Einstein had mathematically turned most of physics on its head. Einstein then tried to find other theories and experiments that might appear to confirm his distorted concepts and his unnecessary and invalid Special Theory. But they also were either incorrect, or wrongly interpreted, or merely coincidences, or approximations, or hypotheses, or speculations, or just mathematical equations, etc. In the end, there are no empirical confirmations for any of Einstein’s distorted concepts or for his Special Theory. The reason is because Special Relativity is just an elaborately contrived and meaningless mathematical theory which attempts to justify its own false premise. In his popular book, Relativity, in pp. 22 – 23, Albert Einstein described another thought experiment within the theoretical environment of a vacuum. He emitted a light ray at velocity c from a stationary light source on the Earth and aimed it toward a stationary railway embankment and toward a railway carriage that was moving uniformly at velocity v down the railway track and away from the light ray (Figure C.1). 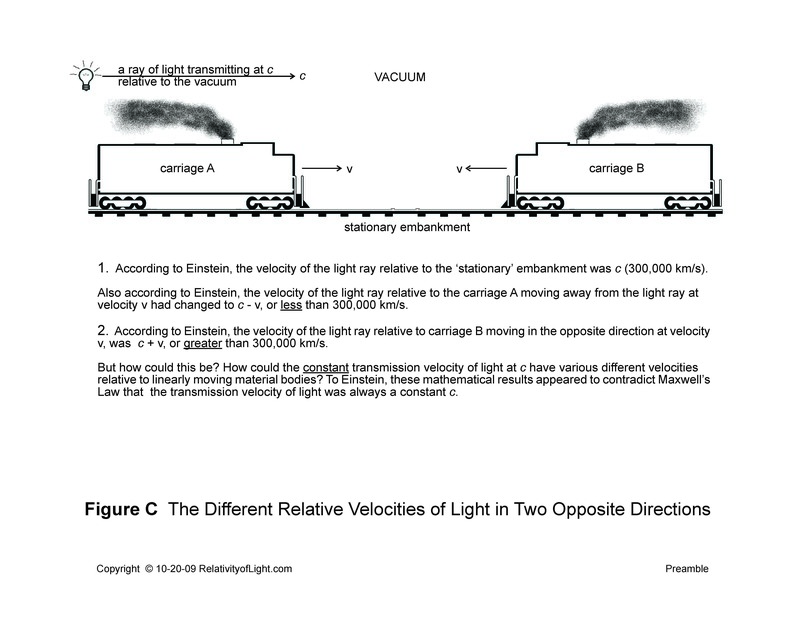 Einstein’s mathematical result of this thought experiment was: the velocity of the light ray remained at velocity c relative to the stationary embankment, but relative to the carriage A moving away at velocity v the light ray algebraically changed to c – v.
What could be the answer to this paradox? The short answer is that Einstein’s paradox was based upon yet another similar false premise. If one measures the velocity of a light ray at 300,000 km/s relative to a stationary body and relative to a linearly moving body, the result will very naturally be two different relative velocities. 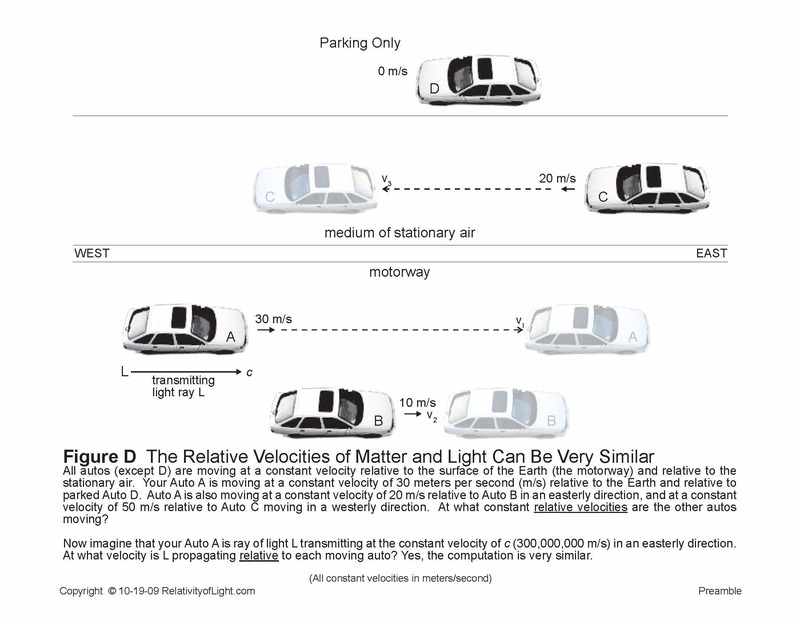 What Einstein again failed to understand in his second thought experiment was that there were really two different types of velocities for the light ray that he was describing and measuring. The first type of velocity was the constant transmission velocity of the light ray at c (300,000 km/s) with respect to its medium of a vacuum (or with respect to the stationary embankment). The second type of velocity was the relative velocity of the same light ray propagating (or traveling) at c – v with respect to the carriage moving at v away from the light ray. It is just that simple. For example, if v = 10 kilometers per second, then c (300,000 km/s) minus 10 km/s = 299,990 km/s. This last figure is the very natural relative velocity of the light ray traveling at 300,000 km/s with respect to the carriage moving at 10 km/s in the same direction (Figure C.1). On the other hand, if the light ray and the carriage were traveling in opposite directions, then the velocity of the light ray at c (300,000 km/s) plus the velocity v of the carriage (10 km/s) would very naturally result in a differentrelative velocity of 300,010 km/s (Figure C.2). These relative velocities of a light ray are very similar to your auto moving constantly down a motorway at 30 meters per second (v1) relative to an auto in front of you moving constantly in the same direction at 10 meters per second (v2) (Figure D). The difference between the velocities of the two autos (v1 – v2) is a constant relative velocity of 20 meters per second (v3). This constant relative velocity results in changing distances, changing time intervals and changing positions of the two autos. However, the two autos are, respectively, still constantly moving at 30 meters per second (v1) and at 10 meters per second (v2) relative to the stationary motorway and relative to the stationary air. The stationary motorway and the stationary air play the part of the vacuum in Einstein’s analogies. All of the above discussion and examples completely explains Einstein’s paradox and his false premise. In effect, Einstein was confused by his own mathematics—algebra. For all of these reasons there never was a problem with Maxwell’s theory for the constant velocity of light at c in a vacuum that needed fixing by Einstein’s mathematics or by his Special Theory of Relativity. Nevertheless, because Einstein never recognized his mistakes or his false premises, he invented a completely new, artificial and impossible velocity for the light ray in a vacuum; all in a desperate, unnecessary and ridiculous attempt to defend Maxwell’s Law, which did not need defending. In effect, what Einstein did was to mathematically change Maxwell’s Law so that every light ray in the Universe had absolutely the same constant relative velocity of c (300,000 km/s) with respect to every uniformly moving body in the Universe at every instant in time; regardless of the actual different relative velocities of such bodies and regardless of whether or not they were traveling toward or away from such light rays (Figure E). This absurd mathematical result was, of course, another physical impossibility. Einstein again used his ingenious mathematical manipulations to accomplish this impossible physical result. The handy Lorentz transformation equations were again his magical method of choice. When applied, they cause the “measurements of time and distance” between two uniformly moving bodies to “vary from each other in such a way that one speed, that of light [at 300,000 km/s], is universal.” This was yet another mathematical “trick that made relativity special” (Smolin, pp. 228, 229). “Covariance became the central focus of every physical concept which Einstein imagined or invented in both his Special Theory and his General Theory of Relativity. It always performed amazing mathematical tricks for Einstein in his world of pseudo-scientific fantasies, but such magical tricks were nothing more than mathematical illusions. They had no physical meaning for the real world in which we live. 1. Maxwell’s constant velocity of a light ray at c transmitting through the medium of a vacuum. This concept is a law of nature. 2. The constant transmission velocity of a light ray at c in a vacuum, which is also traveling relative to many bodies moving at different velocities. This concept describes the relative velocities of any light ray. 3. Einstein’s physically impossible constant velocity of a light ray at c relative to all uniformly moving bodies in the Universe at the same instant, regardless of such bodies’ different velocities relative to such light ray. This clever result of mathematical manipulation was Einstein’s artificial and meaningless so-called solution for the paradoxes which he created. How could anyone have believed that Einstein’s false premises were valid? How could anyone have believed that Einstein’s artificial and mathematically manipulated velocity for a light ray was correct? How could anyone have believed that Einstein’s contrived concepts, distorted by the Lorentz transformations, were correct? How could anyone have believed that Einstein’s entire Special Theory of Relativity, which was filled with artificial mathematical manipulations, had any real physical meaning?